In January, “Walking Weapon” Josh Alexander shocked the entire C*4 crowd and locker room, as he defeated Matt Angel to win the Championship. On April 26th, two former Champions are on the hunt to reclaim the Championship they both lost. The championship that drove both men to a level of competition that neither had achieved in their careers prior to their wins. A championship which Josh Alexander spent a better part of a decade chasing down, before he captured it for a second time. A week and a half-ago, Matt Angel told C*4 management he would refuse to appear unless he was to be granted a re-match against Alexander. Meanwhile, plans were for Durst to challenge Alexander. To meet both top contender's wishes, this will be a three-way, one fall to a finish (no DQ, no Count-out) battle! 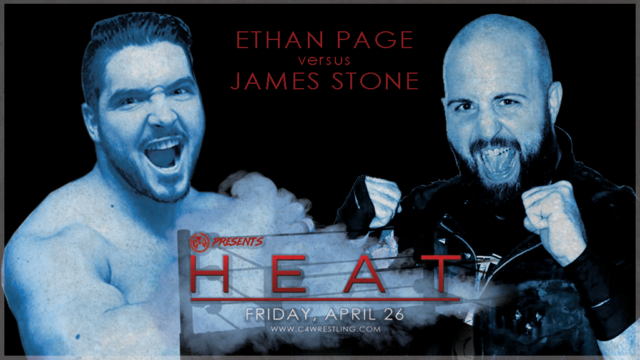 On April 26th, at #C4HEAT – three men will collide in a match which’s stakes couldn’t be higher. A match which features three of the very best doing battle for the biggest prize in C*4. Over the last couple of months, The Butcher and The Blade, Pepper Parks and Andy Williams, have put C*4 on notice. Two weeks Parks and Williams ago took TDT to the absolute limit in a wild brawl throughout the building at #C4ReignOfFire. And a show prior to that, they defeated TDT in their debut. 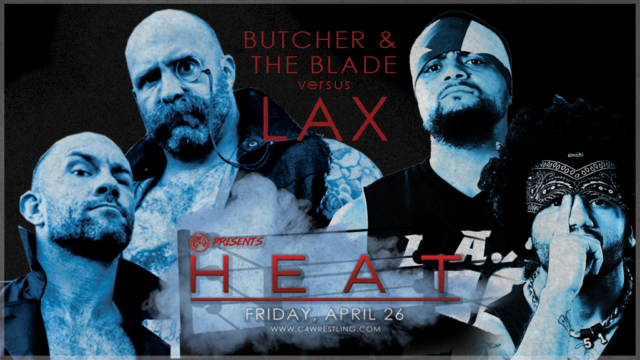 On April 26th, The Butcher and the Blade will have yet another massive challenge on their hands. Returning to C*4 after nearly a one-year absence… A team who have been long-time C*4 favourites, who have developed into one of the most respected and in demand teams on the planet. 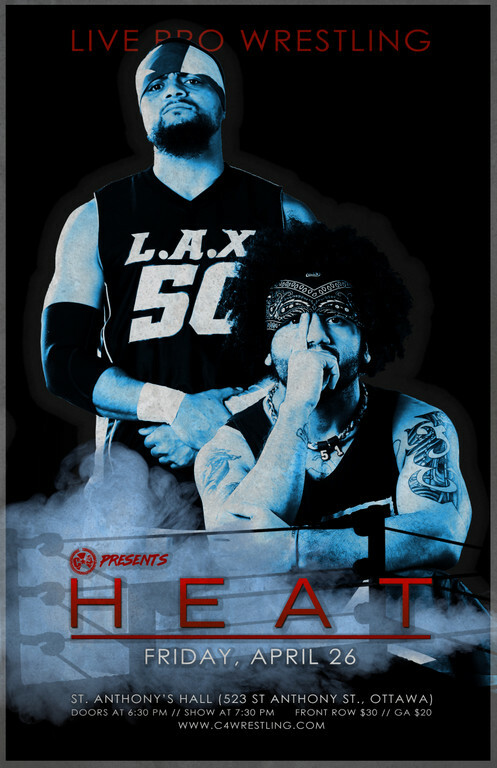 Santana and Ortiz, LAX come to #C4Heat! "All Ego" Ethan Page is one of the most successful Canadian grapplers in the world today. An in-demand independent performer, and an international superstar thanks to his exposure on Impact Wrestling. For over a decade, Page has time and time again silenced critics and continued to climb the ranks of professional wrestling. Page has without a doubt earned every bit of what he has gotten. Another man who has put in just as much time, but has yet to enjoy the recognition is “Scrapper” James Stone. For over 15 years, Stone has honed his craft. The majority of his career spent in the Quebec independent scene, he has been familiar with C*4 fans since the early days of the promotion. Three years ago, after a lengthy disappearance from the promotion, Stone returned as half of “Heavy Metal Chaos”, and became one of the top talents in the C*4 Tag Team ranks, becoming a champion twice in the division. Having found himself solo this season, Stone has floundered. Finding himself in mutli-man contests and looking to regain his footing as a singles talent, the “Scrapper” was doing just that… scrapping and clawing for an opportunity. On March 22nd, Stone scored an impressive singles win, as he defeated former C*4 Underground Champion Benjamin Tull. 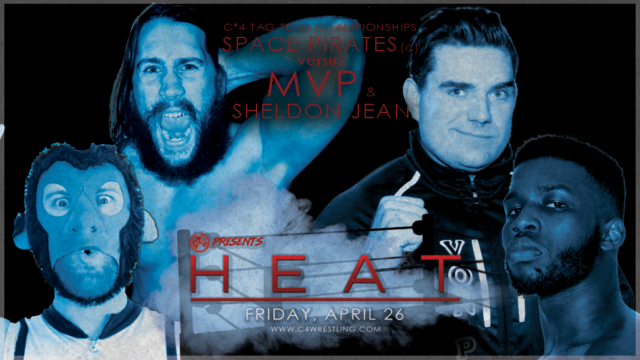 On April 26th, at C*4 Heat, he will attempt to build off that momentum and continue pushing himself further in the singles ranks. Two men with equal experience, but living two very different realities. One man fighting for opportunity, the other fighting to keep a spot and continuing to silence critics. Today we’ve got a three-way tag team match featuring the return of an ROH-based tandem, looking to impress, stepping into the ring with a pair of former C*4 Tag Team Championship teams. All three are clearly looking for a tremendously important victory! This one will be action-packed, and is another contender to steal the show! 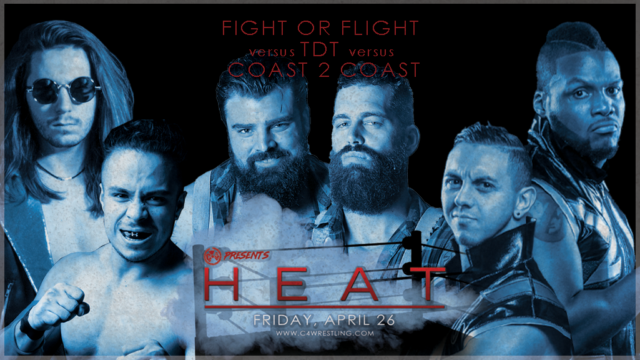 #C4HEAT – Tag Team Championship match, and more! One week from tomorrow we present #C4Heat. We’ve already announced several exciting matches, and we’ve got another pair right now! Last month, Sheldon Jean entrusted “MVP” Michael Von Payton to defend their C*4 Championships solo in a four-corner tag team match. To the shock of many, the debuting-as-a-team, Space Pirates scored a major victory and won the titles. This month, MVP and Jean look to capture their Championships back. Can the duo of Sheldon and Von Payton become two-time Tag Team Champions? Or will the Space Pirates defend their newly acquired Championships? 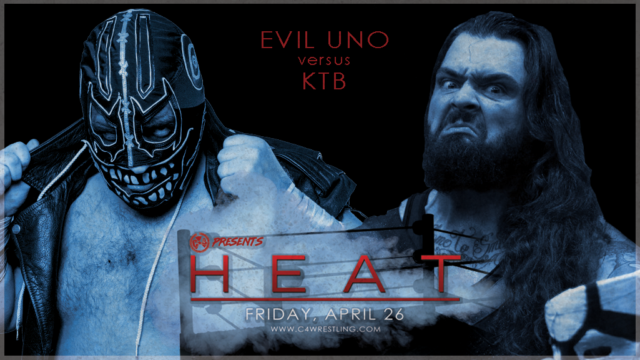 Next up a sure to be smash-mouth battle between C*4’s resident creeper, Evil UNO will collide with the returning KTB. The former Kyle The Beast debuted in C*4 last season, and made an impression – and has a win over TDT’s Thomas Dubois. As of late, KTB has been turning heads in Game Changer Wrestling, and is proving himself to be a talent to watch every time out.